Virtually every news cycle seems to feature children as victims of military actions, gun violence, economic injustice, racism, sexism, sexual abuse, hunger, underfunded schools, unbridled commercialism—the list is endless. Each violates our sense of what childhood ought to be and challenges what we believe childhood has always been. But the ideas that shape our notions of childhood emerged less than a century ago. Reformers and policy-makers had struggled toward creating a modern childhood since the 1830s. They sought to build an extended, nurturing childhood, one that freed children of responsibility and allowed them simply to be children. Their efforts led to modest improvements in education, efforts to eliminate the worst forms of child labor and somewhat better medical care. By the early 1900s, enough progress had been made—both in terms of material improvements and rising expectations—that the American social worker, civil rights advocate and anti-child labor activist Florence Kelley could declare in Some Ethical Gains Through Legislation that youngsters had “a right to childhood.” But the catastrophic effects of the First World War on civilians in general and children in particular energized child welfare reformers, including Eglantyne Jebb, the Englishwoman who founded the Save the Children Fund. Jebb would be one of the leading figures in the movement that led to the “invention” of childhood in 1924. The Declaration emerged from empathy for children that had been building for decades. Yet the promises it made would ring hollow in the face of a world-wide depression, and a second, even more devastating world war. Indeed, violence and disorder would plague children’s lives for the rest of the 20th and into the 21st centuries. James Marten is professor and chair of the history department at Marquette University. He is a past president of the Society for the History of Children and Youth and former editor of the Journal of the History of Childhood and Youth. 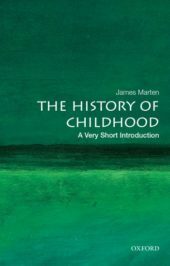 Among his nearly twenty books are The Children’s Civil War (University of North Carolina Press, 1998), the six-volume A Cultural History of Childhood and Family (co-general editor, Berg, 2010), and The History of Childhood: A Very Short Introduction (Oxford, 2018). Australia is the only remaining “developed democracy” that has not enshrined the Universal Declaration and the Rights of the Child across its states. The abuse of human rights is obvious in this country with our off-shore detention and the impediments to proper redress for the tens of thousands of us who were raped as children by clergy and others in Institutions. I believe an examination of the current redress scheme will show that Australia is in breach of the UN convention while victims have to allow themselves to be repeatedly re-traumatized in their already failing scheme.